"Raises max MP by 1, and enhances magic and summon power. Capable of dealing a string of critical blows." Speak to Kairi in the Secret Waterway after rescuing her. "A well-balanced weapon with a very powerful thrust." Speak with Naminé after defeating the Darkside. "Enhances magic and increases the duration of a Drive Form." Unlock the Gate in Twilight Town. "A weapon transformation brought about by installing an Ability Unit in a Kingdom Key+." "A Keyblade that will guard you from many hurts. Its powers help accelerate your growth." Defeat Data-Roxas with a ★ rank. Slay 60 enemies with the Oathkeeper. Slay 120 enemies with the Oathkeeper. Slay 180 enemies with the Oathkeeper. Slay 240 enemies with the Oathkeeper. 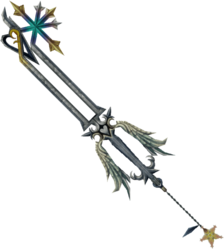 The Oathkeeper's shaft displays two hearts, and its handle bears two angel wings, contrasting the bat wings that comprise Oblivion's handle. The teeth are fashioned in the shape of the Kanji for "light" (光), corresponding to the Oblivion's kanji for "darkness". Its Keychain token is Kairi's Wayfinder, a star sewn together from Thalassa Shells. In Castle Oblivion, it is replaced by Naminé's trinket until the illusion over Sora's Thalassa Charm breaks. When it is summoned by the user, Oathkeeper emerges in a bright, yellowish-white light. 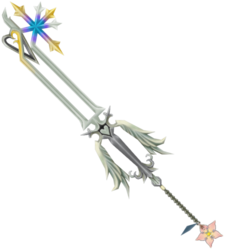 The Oathkeeper's English name stems from its Keychain, Kairi's Wayfinder, being a reminder of Sora's promise to her. Its Japanese name, "Oath's Charm," also reflects this status. In the intro of Kingdom Hearts 3D: Dream Drop Distance, Roxas is shown dual wielding the Oathkeeper and Oblivion against Axel; Riku also wields the Oblivion against Xemnas, while Sora uses the Oathkeeper. A limited edition Oathkeeper was released with four other Keyblades in a special Play Arts Figures accessory set, Play Arts Arms. 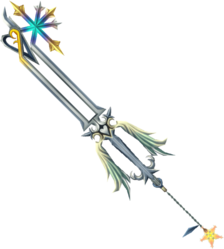 In Kingdom Hearts, the Oathkeeper has a decent reach and is well-balanced, making it an acceptable substitute for the Lionheart. In Kingdom Hearts II, its ability of Form Boost makes it much more useful for leveling Sora's Drive Forms, rather than for regular battle. In Kingdom Hearts 358/2 Days, this Keyblade's ground combo begins with a thrust forward, followed by a diagonal vertical strike from the right side, and continues with a lightning-fast rush consisting of a horizontal slash left, the same slash right, and a vertical downward slash and ending with a jump back and a rushing diagonal spinning slash. You can change the combo and end it after the first upward slash by pressing ; this will trigger a jump into the air and a slightly angled spinning slash. The aerial combo is a rush forward and two downward spinning slashes from either side. 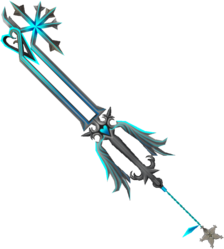 In Kingdom Hearts Re:coded, Oathkeeper's Clock abilities are the best defensive abilities among all the Keychains in the game.